I once spent a summer biking across the country. I did it through a program that raised money for Habitat for Humanity; along with 29 other kids from colleges across the country, I vowed to raise a dollar for every mile I biked. We started in New Hampshire, dipping our bicycle wheels in the Atlantic sea. Three months later, we concluded our journey in Vancouver, Canada and dipped our wheels into the Pacific. We each biked around 4000+ miles total, and my group raised over $100,000 for Habitat that summer. But if I'm being honest, philantrophy wasn't my main motivation for biking. I'd just finished a particularly rough year in college, both physically and mentally. I'd gained a lot of weight, and felt lonely and isolated. The boy I liked had graduated and moved to New York, my best friend was studying abroad in Paris, and my roommate was dating a deadbeat who constantly hung around our apartment leaving bad vibes. I'm usually a cynic — I'm type-A through and through. Always early. The kind of person who is described as needing to let her hair down, or having something up her well... you know what. Biking across the country seemed like a way to get out of my funk. I vowed that I would make the most of this crazy adventure that I had committed myself to, for better or for worse. So that summer, I found myself saying "yes" to every opportunity that the trip and my teammates offered. I was living the Year of Yes before it became a thing: I found myself spontaneously jumping into Lake George in my full cycling gear, helmet and all; I found myself agreeing to bike 10 miles off course to find the best ice cream in small town Wisconsin; I found myself spending the night huddled in a public restroom to escape a sudden and intense thunder and lightning storm in the Badlands. How is this relevant to this recipe? It's not, not really. But the first time I ever had a sour cherry was on that trip. We were in a secluded country road somewhere in Pennsylvania. My friend Lindsey and I were towards the back of the group when we came upon a gaggle of our other teammates at the side of the road. Some of them had hopped the fence separating the small country road from the orchard on the other side. Lindsey and I followed and shoved as many cherries as we could into the back pockets of our jerseys, giggling at our rebelliousness and constantly looking over our shoulders to see if we would get caught. 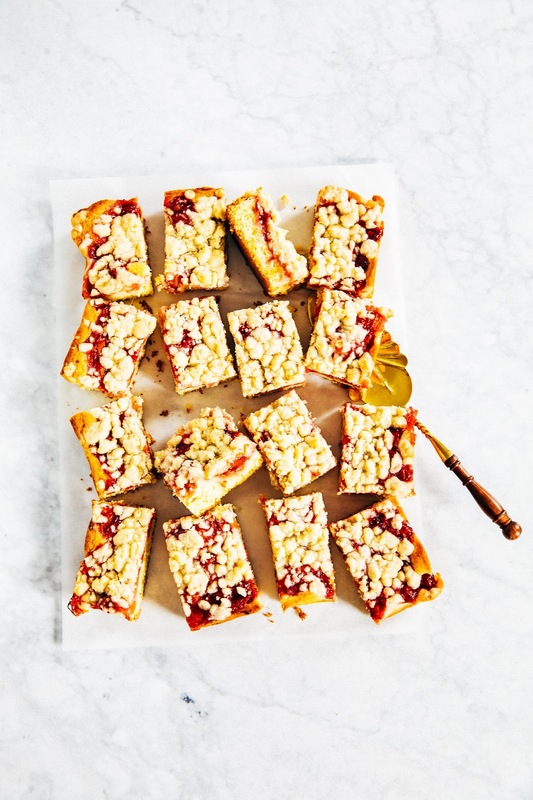 This recipe comes from Luisa Weiss of The Wednesday Chef's cookbook, Classic German Baking. 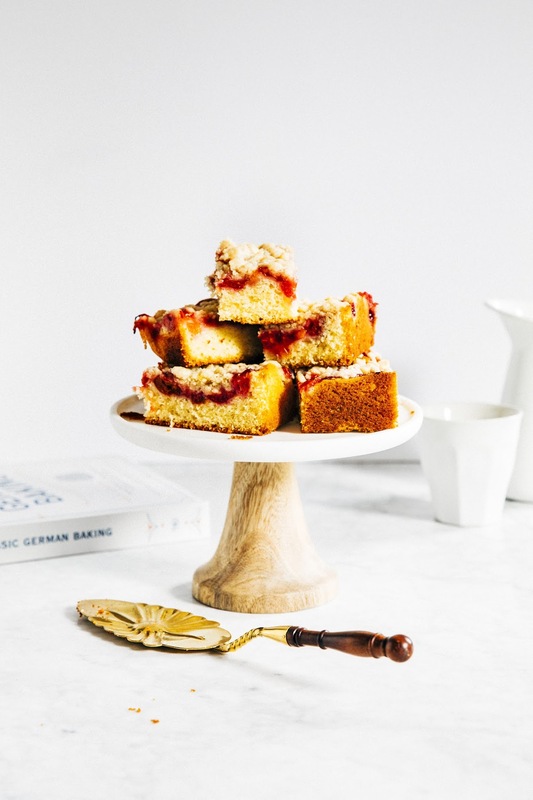 If The Great British Bakeoff is America's de facto guide to British bakes, Luisa's cookbook should be our guide to German baked goods. The only problem is that some of the recipes use ingredients that are more commonly found in Germany than they are here. 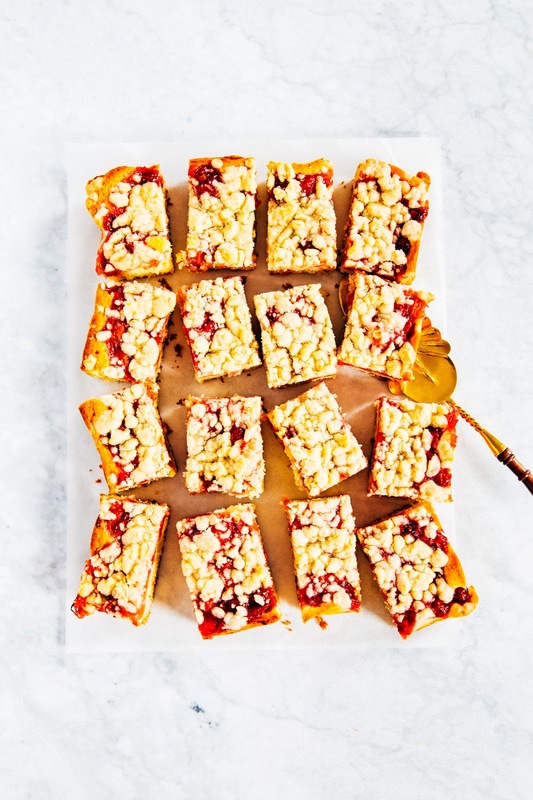 This particular recipe for sour cherry streusel (kirschstreuselkuchen, in German) uses preserved sour cherries, but I've adapted it to use the fresh ones that are currently abundant in all of New York City's farmers markets. Enjoy! Sour cherries are pretty region-specific; I remember having a hard time finding them when I lived in both Oregon and California. In a pinch, you can substitute regular cherries but know that your cake might be a little sweeter than mine since your fruit will be less acidic. The cake recipe doesn't seem like it will make enough batter for the pan, but trust the recipe! Spread it out evenly across the pan (it will seem like there's barely enough, but there should be enough to have an inch of batter spread across the pan), and it will rise beautifully into a fluffy cake. It can be hard to tell when the cake is done; the best markers are if the fruit topping is bubbling slightly and if some of the streusel has turned into a golden brown color. You can also stick a skewer inserted into the center of the pan — if any fruit comes out with the skewer, it needs more time as the fruit topping should be fairly set at the end of the baking process. In a medium bowl, combine 1 cup plus 1 tablespoon all-purpose flour, 1/2 cup cold unsalted butter, 1/2 cup granulated sugar, 1/4 teaspoon kosher salt, and a pinch of ground cinnamon. Work together with your fingertips until the mixture is well combined and crumbly, with both lima bean- and pea-sized clumps. Place in the refrigerator until ready to use. Combine 12 ounces sour cherries with 1/4 cup water and 1/4 cup granulated sugar into a medium, heavy-bottomed saucepan over medium heat. Bring to a simmer and cook until the cherries are very tender, about 5 minutes, before crushing with a wooden spoon or heatproof spatula. In a small bowl, whisk together 2 tablespoons cornstarch with 2 tablespoons water. Add the cornstarch mixture back into the saucepan; the juice will almost immediately thicken and gel. Remove the pot from heat and continue to whisk until the mixture is smooth. Fold the remaining 12 ounces sour cherries back into the hot, thickened mixture and set aside on a wire rack to cool. Center a rack in the oven and preheat to 350 (F). Prepare a 9 x 13-inch baking pan by lining with parchment paper, letting the sides hang over the edges to function as a sling after baking. Spray the parchment paper with cooking spray, and set aside. In the bowl of a freestanding electric mixer fitted with a paddle attachment, combine 1 cup unsalted butter and 3/4 cup plus 2 tablespoons granulated sugar. Beat on medium speed for 2 to 3 minutes, or until light, fluffy, and doubled in volume. Reduce the mixer speed to its slowest setting and add 3 large eggs, one at a time, only adding the next egg when the previous egg has been fully incorporated. Add 3/4 teaspoon pure vanilla extract, and once incorporated, stop the mixer and use a rubber spatula to scrape down the bottom and sides of the bowl. In a medium bowl, whisk together 2 1/3 cups all-purpose flour, 2 teaspoons baking powder, and 1/4 teaspoon salt. 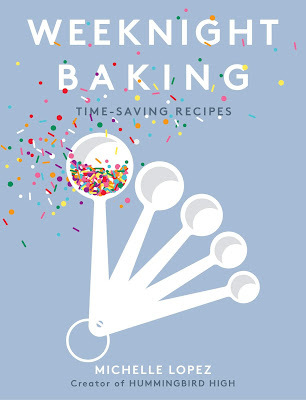 Turn the mixer speed back to its slowest setting and add the dry ingredients all at once; be careful not to overmix! Continue mixing on the slowest setting, and stop when the dry ingredients have just about disappeared into the batter. Add 1/4 cup crème fraîche and continue mixing just until incorporated. Transfer the batter to the prepared baking pan, using an offset spatula to smooth the batter evenly across the pan. Distribute the cherries and thickened juice evenly all over the cake batter. 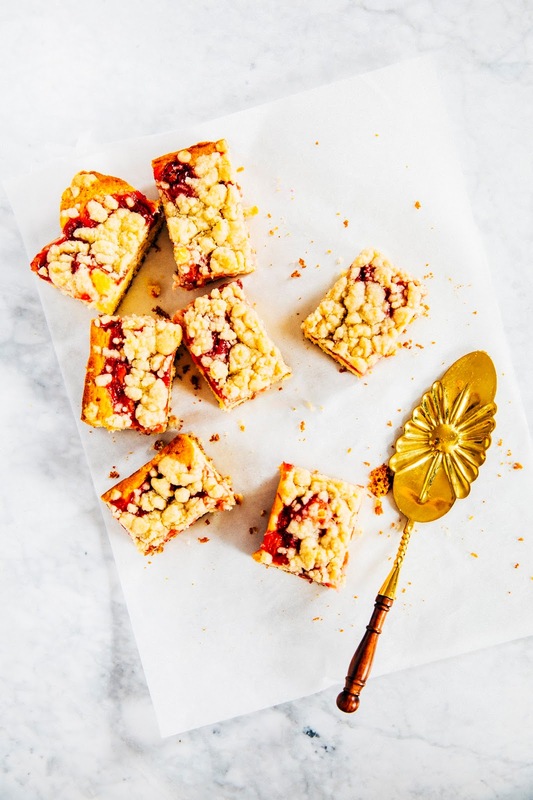 Remove the bowl of streusel from the refrigerator and distribute the streusel evenly over the cherries, breaking up any large clumps with your hands. 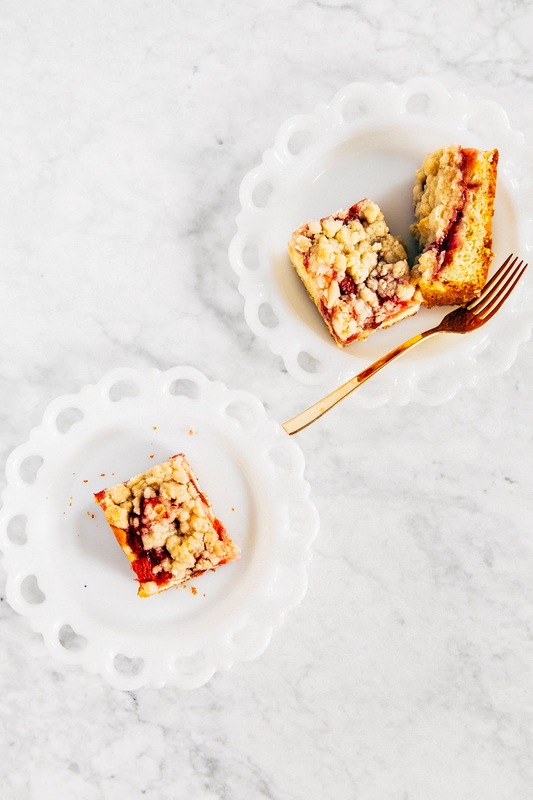 Transfer to the preheated oven and bake for 45 to 50 minutes, or until the streusel is light golden and a cake skewer inserted into the center of the cake comes out with few crumbs. 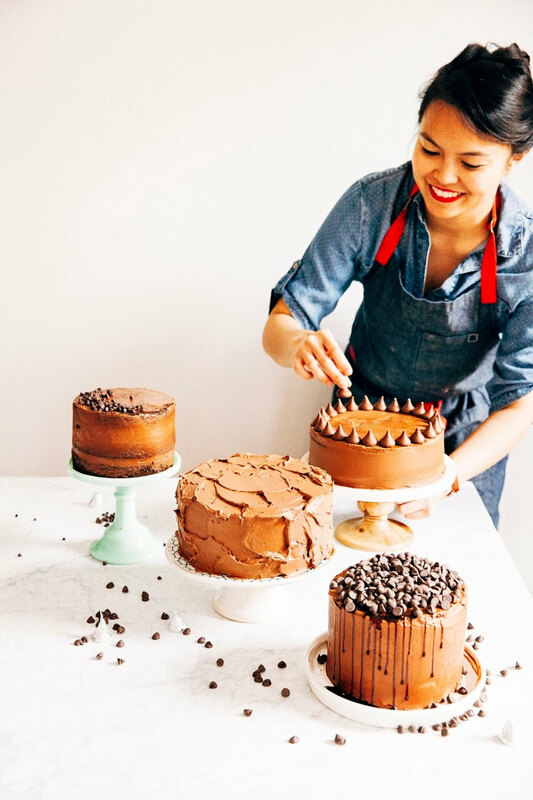 Once the cake is done, transfer to a wire rack to cool slightly — the cake can be served slightly warm or at room temperature. Use the parchment paper overhang to remove the cake from the pan and serve as desired. The cake is best on the day its made; the streusel tends to get soggy the longer it sits.